While many companies utilize a document shredding service in an effort to protect their client and internal data, and this secure destruction method also doubles as a way to minimize liability in the event of a data breach. Shredding your documents yourself can create holes in your security system if you don’t shred the right documents or if employees short cut shredding processes to save time. On the other hand, using a document shredding service protects all of your information and endorses an atmosphere of security and protection to both your clients and employees. 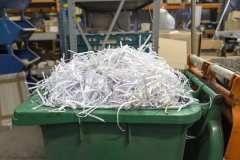 Your particular organization may decide to use a weekly, bi-weekly, or monthly shredding service that can be performed both on and off site. After securing all that effort into properly destroying confidential data, you’ll want to have a record of the event to store for future protections. A certificate of destruction does just that. In the midst of all the identity thefts and data breaches that are happening at an all-too-consistent basis, keeping a log of your document destruction process is crucial to minimizing and downright avoiding legal implications. 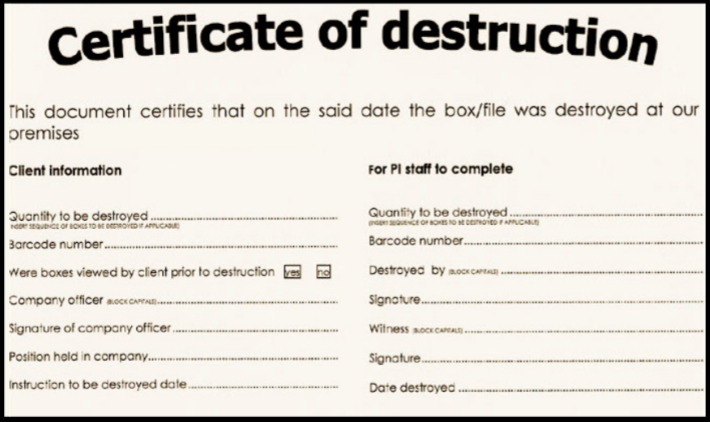 When scheduling a paper shredding service to destroy your documents, confirm with the service professional that they can provide a certificate of destruction. You should receive your certificate on the same day your service is completed. Have your confidential documents destroyed at your location with this on-site shredding service that comes directly to you. A mobile shredding truck parks outside your building where trained professionals transport your documents from your building to the industrial-grade shredder built into the vehicle. You can witness the entire shredding process firsthand. No visual or physical contact is ever made between the material handlers and your papers. For companies that produce mass amounts of materials that require shredding, the offsite shredding service may be the best option. Locked bins are placed within your building so that your employees can drop in confidential papers to be shredded as they are produced. At regularly scheduled intervals, a secure truck will make a pickup of the bins, which are then transported to an offsite shredding facility. All these papers are co-mingled and cross-shredded for added security. Any hard drives, electronic media devices, and data-storing hardware can and should be properly destroyed if they once held confidential data pertaining to internal or client information. 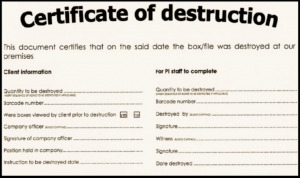 Similar to a document shredding service, you can request a certificate of destruction as proof of your efforts in secure electronics destruction practices by your company. If you are looking to start a document shredding protocol or replace your current one, Shred Nations is your solution. We work with locally-based and operated shredding services all across the nation that provide customized options for businesses of all sizes. To get free, no-obligation quotes from top shredding professionals in your area, call us now at (800) 747-3365 or use the form on the right. In minutes, you will be contacted with free quotes to choose from.